Here is a guide in which you are going to find out 4 ways to fix Windows 10 Creators Update WiFi problems and connectivity issues. 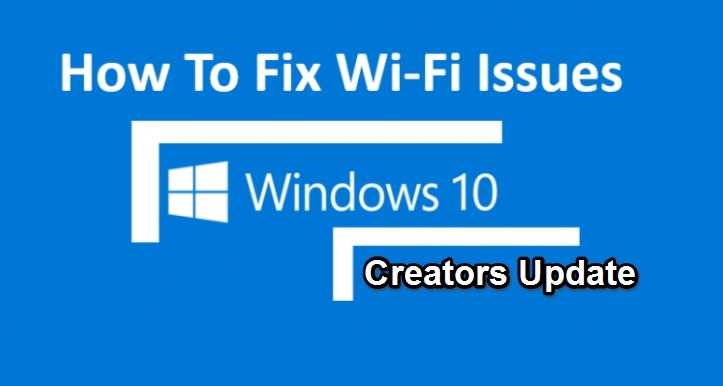 We are going to show you different methods to resolve Wi-Fi problems on Windows 10 Creators Update running desktop PC, laptop or tablet, so that if one doesn’t work you can try the other solution to see if that works to get WiFi back to working state. The Windows 10 Creators Update is mostly without any major bugs and errors which used to a common theme in previous Windows updates. However, like any other major update, you cannot completely discount all possibilities of errors when installing a new big software update, especially on PCs having older hardware. Some users are reporting issues with WiFi connectivity and speed after updating to Windows 10 Creators Update. WiFi connection problem is the most commonly reported error ever since the Creators Update started rolling out a few weeks ago. Frequently complained about WiFi errors include, slow WiFi speed, WiFi not connecting at all or gets disconnected unexpectedly, and downloads getting stuck in the middle. Although heart of the issue may lie with the Creators Update itself, however, sometime problem could reside somewhere else. Like when you upgrade WiFi adapter, its driver might have got corrupted or failed to update properly. Or, you might be using older network driver that was compatible with the older Windows update but doesn’t work with the new update. Incorrectly configured network settings and drivers could also cause connectivity issues among many other reasons. In the tutorial below, we are going discuss various methods to fix the WiFi issues after installing the Windows 10 Creators Update (1703). 2 – Click on Update & security > Troubleshoot. 3 – Select Network Adapter followed by clicking Run the troubleshooter. 4 – Select the network adapter you wish to fix, for this guide, let’s say it’s Wi-Fi. 5 – Hit Next button. This is start automatic troubleshoot to find and fix any problem linked to WiFi network. Once complete, check if WiFi is back on by visiting any webpage from the browser. 1 – Head over to Settings. 3 – Click Status and then click the Network reset link located at the bottom of the right window pane. 4 – Hit the Reset now button and click Yes to confirm your choice. 5 – Once done, restart your computer. Note: This method will uninstall any active VPN that you were using before on Windows 10. So you might have to reinstall network software, such as VPN client. Also, you will be asked to manually connect to a WiFi network by entering password. Now, try opening a webpage or online content to see if it’s back working again. If above methods don’t fix the network issues on Windows 10 and you are still facing slow or no WiFi problem, it may be because your device is running on an older version of network driver. This can be fixed by downloading latest driver from the official webpage of the manufacturer of your network adapter and update it on your device. Note: Also check if there is any latest beta version available for your network drivers as it may work on new Windows 10 update instead of the full version. Standard download and installation instructions are usually given on the manufacturer’s website, which you should follow to avoid issues. However, you can also user the following steps to get latest version for your Windows 10 network adapter. 1 – Visit Manufacturer’s webpage to download latest network adapter. 2 – Make sure to extract downloaded drivers on computer. Use an empty folder for extracting files. 3 – Now, open the Power User menu by pressing the Windows Key + X keyboard shortcut and select Device Manager. 4 – Expand Network adapter and right-click on your WiFi adapter from the list and select Update Driver Software. 5 – In the next window, click Browse my computer for driver software. 6 – Click Browser button and locate the network adapter driver and select from where you extracted folder on PC. 7 – Make sure that the Include subfolders option box is checked just below the drop-down menu. 8 – Once done, hit the next button. This will install latest adapter drivers on your device. However, sometimes reverting back to the previous version of the network adapter also works, so try Windows 7 or Windows 8.1 WiFi adapter drivers to see if they work to permanently fix the issue. If none of the above solutions work to fix network and WiFi issues on the Creators Update, perhaps it’s time to roll back to the older Windows 10 version. Sometimes new Windows 10 versions comes half prepared and could contain bugs that might be blocking smooth network connection. Wait until the update for your network adapter is released by the manufacturer or a bug-free Windows 10 update is pushed by Microsoft. This should be your last course of action when no other solution works to fix Wi-Fi issues. Often a simple Windows restart, resetting router or wireless extender solves WiFi issues, so try these as well before restoring previous version of Windows 10. Let us know if above solutions worked to fix WiFi issues on your Creators Update running Windows 10 device the comments section below.